This a great song for anybody with a sense of humor and a economic interest. Or somebody that wants a basic understanding of Quantitative Easing, but would rather not read an article from Bill Gross or watch CNBC. "Quantitative Easin, the time has come to relever. Lending short-term, baby that's just teasin' - I want to lend forever. Now the credit markets are misbehavin', I think they need a spanking. That's why I'm ready to show them, some very special central bankin'."...... "baby I want to buy the long bond".... "one part pleasin', five parts act of desperation".... "we're going to have to quantitate"
Had to delete the embed as it was causing issues with the blog formatting. See the song on youtube.com. October was another strong month with the SP500 up over 3% and the Opportunistic Model up almost 10%. Combined with a strong September, the market has had an incredible run during what is typically the worst 2 month period in the stock markets. Whether this rise has been due to better economic news, strong earnings reports, speculations on quantitative easing, or the likelihood of Republicans retaking Congress, these events have helped lift the moods of the markets catching most experts off guard. Now these same experts provide constant analysis of how the market typically has the best 6 month period of a presidential cycle during the November to April period following the midterm election. Will they be correct this time? The Chicago PMI came in at a surprisingly strong 60.6 in October well above the 57.6 expected by economists. While this was only slightly higher then the 60.4 in September, it showed a strong jump in new orders to 65. Production was off the chart at 69.8 showing deep strength in the report. Market initially snapped back, but some slightly weak Michigan consumer sentiment data has weakened the market. Considering a strong September and October it wouldn't be surprising to see a sell the news scenario at the beginning of November. Though I'm slightly concerned that too many pundits are suggesting such a result. Looks like 1180 in the SP500 is crucial. Any breakdown would likely signal short term selling. Long term though, any selloff in November will be a huge buying opportunity. The Nov - Apr period of a mid term election is historically off the chart bullish. Only concern is that it usually comes after a weak Sept - Oct period setting up the rally after the elections. Cephalon (CEPH) again raised estimates for 2010 to $8.3 and provided guidance for 2011 of $8.55. Typically though, don't expect much action in the stock tomorrow. Although the stock remains incredibly cheap at a sub 8 PE, the market is concerned about drugs coming off patent and a slowing of growth. Its interesting listening to conference calls as analysts dig down into minute details. They seem to over analyze every bit of data and seem to miss the big picture that this biotech company has a great management team that continues to under promise and over deliver. More on The Jones Group. The stock likely sold off way too much, but I don't have a comfortable feeling on this sector and we're already invested in Liz Claiborne (LIZ). Amazing that Cramer is always portrayed as the 'Crazy One' but he seems to have a calming effect on some of the stocks he brings onto his show. JNY CEO on Mad Money tonight. As I said earlier, bad companies make excuses. Sure they may have a higher mix of shoes, but they clearly didn't position themselves correctly coming into the Q. Though Wall St tends to over react so don't join them. The Jones Group (JNY) reported higher costs today causing them to miss earnings estimates by a little over 10%. Consequently the stock has slumped over 20%. Considering the stock trades at a remarkably low 10x estimates the reaction in the market has been harsh. JNY blamed higher commodity costs such as cotton, wages from employees in Asia, and transportation costs from having to ship goods via air which naturally costs a lot more. The first 2 costs should have been built into analysts models and impact most of the industry. The higher transportation costs could very well be a JNY specific issue of not ordering enough inventory early. The news has caused a huge drop in the stock of Liz Claiborne (LIZ) seen as a major competitor to JNY and other retailers owned in our portfolios including Sears Holdings (SHLD) and Dicks Sporting Goods (DKS). Interesting Investment Outlook from Bill Gross today. Bill is a Managing Director at PIMCO and commonly known as a leading expert on the fixed income market. Today Bill published a report titled Run Turkey, Run. Basically a slam on the QE2 plans and the end of the 30 year bull market in bonds (finally!). Not to mention a slam on the 2 party political system that leaves the American people high and dry. The bondholders remaining after QE2 will be like the turkey waiting on Thanksgiving Day. They might receive some immediate fat gains from bond yields being pushed lower for the last time, but ultimately they'll be served up on the platter of rates that can't go lower. Rates ultimately will begin creeping higher. Did I read that correctly? Leading highflying networking stock F5 Networks (FFIV) just announced a $200M buyback while reporting Q3 earnings. Wow! FFIV has a forward PE of 30+ so its almost arrogant for management to presume the best use of cash is by buying back stock. Also, with a market cap over $8B this buyback won't provide much of a dent into outstanding shares. The company continues to blow out numbers similar to favorite Riverbed Tech (RVBD) owned in our portfolios so it could be an indication of the 5-10 year growth plan they can envision. Still its a head scratcher unless they are just hoping to buy the next time the market corrects 20% on this stock. And it will happen. Definitely something to watch! Details below from Briefing.com. Company refused to provide information on the failed buyout process so investors are left guessing the interest level. On one hand, its understandable that management doesn't want to discuss details in order to not hurt their hand in future discussions. On the other hand though, they need to do something better to support the stock price and shareholders. They should provide some expectations on sales price since they apparently aren't willing to sale to the highest bidder. They're leaving too much open for interpretation and the market has spoken that its not acceptable. Savinet Pharma (SVNT) might be one of today's biggest losers, but it could be tomorrow's biggest gainer. SVNT announced that they have been unable to find a buyer at a suitable price for the company. The stock initially dropped over 50% to a 52 week low on the announcement. Was the move warranted? Regardless of whether SVNT is bought out, the company still owns an orphan drug, KRYSTEXXA, recently approved by the FDA for the treatment of severe gout cases where no other option exists. The intrinsic value of the company hasn't changed because they couldn't find a deal for an agreeable price. The only change is the value an investor can expect to receive in the short term. With the drop in price, I'm sure a significant amount of companies have called seeing if management would drop there price to a level likely very attractive with the stock currently trading in the $12s around midday. SVNT could be tomorrow's biggest gainer. On Thursday, purchases MedcoHealth Solutions (MHS) for the Net Payout Yield Portfolio. As mentioned back on Aug 23rd [MedcoHealth Solutions: Ultimate Net Payout Yield], MHS was on the radar for addition to this portfolio. It almost ran away from us after hitting bottom just one week after writing that post, but this recent pullback touch the 50ema and gave us an entry point. MHS is on a massive stock buyback spree signaling not only a financially strong company, but also a cheap stock. Just bought a half position at this point as typical for this portfolio size. After the bell on the 20th, Terex (TEX) reported earnings that showed an improvement in all divisions except for Cranes. Unfortunately for TEX, Cranes is the largest and most important division though it's impact has been significantly reduced this year as sales bounce back in Aeriel Work Platforms (AWP), Materials Processing (MP), and Construction . The results were a slight disappointment mainly due to unexpected order cancellations and pushouts in Europe. Based on the results from Manitowoc (MTW) reported earlier this month, it wasn't too surprising that Crane sales were weak. TEX saw a nice improvement in backlog even including a 2% sequential increase in Cranes. All in all with rental companies such as United Rentals (URI) reporting high utilization rates and the ABI turning positive it appears that the weak division in the TEX portfolio will finally turn around in 2011. Catching up on trading from yesterday. Trimmed half our position in Caterpillar (CAT) in the Net Payout Yield Portfolio after a weak reaction to a positive earnings report. Also after the huge run and the lack of a buyback implemented by CAT leaves the NPY at only 2.4%. This is not significant enough for this portfolio so discipline requires us to sell. CAT has been a long term holding of the portfolio, but the gains in the stock and the limited payouts suggest the stock may be topping. Not to mention the negative action in the stock from bullish earnings. From the chart, its apparent that at least the short term action is negative. Wow! Wow! Wow! While expecting huge results from Riverbed Tech (RVBD), the actual numbers were beyond any expectations. RVBD reported Q3 earnings of $.34 versus $.27 estimates. Revenue increased 17% sequentially to $148M vs $135M estimates. Not often that a company reports a revenue beat of 10%. In fact both numbers easily exceed the Q4 estimates. Very impressive! These numbers had to be impressive to justify the 35x forward PE. Hence, Stone Fox unfortunately trimmed a third of our remaining shares in the Growth and Opportunistic Portfolios leaving roughly 50% of the original investment. Considering the stock was up over 100% in both portfolios it was just time to take more profits considering the wide swings in stock trading. Equinix (EQIX) dropped 30% after missing earnings and VMWare (VMW) dropped 7%. The Architecture Billings Index (ABI) has been one of the weakest indexes to recover from the recession. The index measures the work of architects on non-residential construction projects and usually signals work in the next 9 to 12 months. The September Architecture Billings Index was up 2.2 points to 50.4, marking the fourth consecutive month of increases, the American Institute of Architects said. Finally suggesting a recovery in the very weak construction area. Also encouraging was that the project inquiries index hit 62.3, the highest level since 2007. Apparently the US finally sees a recovery in construction activity early next year. This will help companies like Terex (TEX), Manitowoc (MTW), and Ingersoll-Rand (IR) which haven't benefited as much from the gains in industrial spending. Today Lihua International (LIWA) announced a major supply contract for copper anode equivalent to nearly 40% of their expected 2011 production. Even more incredibly is the announcement of more then 80,000 metric tons is potential contracts which alone exceed the production expectations for 2011 even after building another facility. Guess this explains why the stock soared over 11% yesterday. Guess this news wasn't that guarded. LIWA along with several other Chinese reverse merger small caps continue to be the cheapest investments into the China economy. Yet most investors continue to avoid these stocks due to fraud scares as if the US market is that safe. 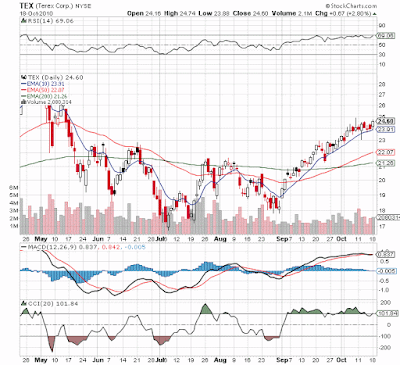 Terex (TEX) got a $40 target from Buckingham Research today suggesting as much as a 65% gain from these levels. TEX is a leading construction equipment company specializing in AWPs and Cranes. TEX will benefit from the recovery from the global recession and the return to infrastructure building around the world. Can't find any specifics on the upgrade other the headline details of the $40 target. The target while aggressive should be in line with expectations considering that management has a viable plan for $6 in earnings in the next few years and global growth should oblige. Hudson Squares Boosting of it's Apple (AAPL) price target to $500 this morning is all the rage. Clearly nobody was paying attention during the financial crisis when we reported back in 2009 a Minyanville.com article that predicted AAPL would hit $1,000 [Apple to $1,000?]. High price targets were ignored back then but now they are all the rage. Interesting Bloomberg report on increasing competition for Indian banks not only for employees, but also the potential for new licenses to be issued by the government. The main thrust of the article is the potential implementation of 'gardening leave' which bans employees from working for a competitor for 6 months unless they pay a fine, but the more important aspect for the 2 Indian banks trading in the US, ICICI Bank (IBN) and HDFC Bank (HDB), are the new bank licenses to be issued by the Indian central bank. As the CRB Index grabs more and more headlines attention, an investor needs to understand the commodities that make up the index. 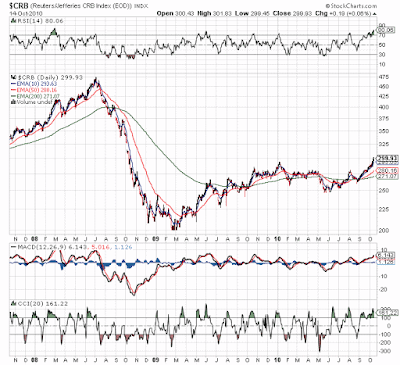 For more then 50 years, the CRB Index as served as the most widely recognized measure of the commodities markets. The index is comprised of 19 commodities with agriculture comprising 41% of the index followed by energy at 39%. Crude oil is by far the largest individual component at 23% followed by numerous commodities at 6% such as Copper, Corn, and Live Cattle. Yes, that's correct. Live Cattle ties for the 2nd biggest component in the index. Great summary information from the CEO of US Global Investors on the impact of China on Copper supplies. Copper is expected to be in shortage in 2011 due to the return of growth in the US and Europe plus the unsatiable demand in the emerging world. Average single family house - 439 poundsAir conditioner -52Refrigirator - 5Automobile - 50 As can be seen, growing domestic demand in emerging markets for homes, air conditioners, and automobiles will strain the supply of copper. Supplies are already dropping even though home building in the US is near historical low levels. Imagine when the US begins even normal levels of construction come 2011 or 2012. Below is a chart from BMO Capital on the imports of copper from China. The numbers continue to surge making China by far the dominant influence on demand. 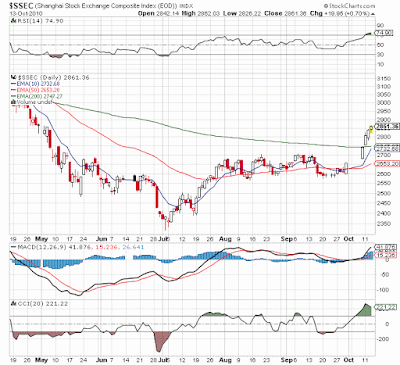 The China stock markets have been on a major 6 day winning streak taking the Shanghai Index from 2,600 to nearly 2,900. Though the below chart doesn't capture the roughly 0.6% move overnight, this index has been on a major rally. 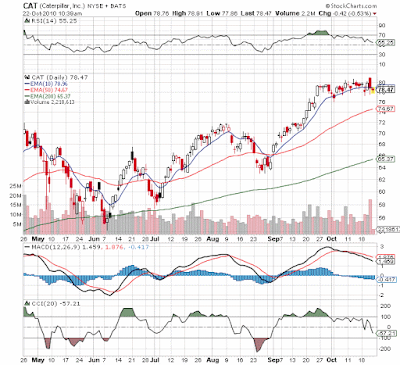 Its likely to end soon as the RSI and CCI numbers already show overheating without the lastest results included. In a dramatic surge, Intrade.com now suggests that the Republicans might just get control of the Senate. The odds have been relatively low most of the year until recently. Intrade shows a nearly 46% chance of Republicans gaining control up from a lowly 30% chance back on October 1st. This dramatic change is clearly being seen in the stock price surge in October. Less power for Obama means higher stock prices for a market trading at low valuations. All the news today is about Apple (AAPL) clearing $300. Ok, maybe just the financial news because of the heroic rescue of the trapped Chilean miners. Its amazing though that the financial media still becomes fascinated with these psychological numbers. What does $300 really mean? Does it tell an investor anything about value, market cap, or future gains? No, no, no. Typically it can be assumed that a stock with a price tag above say $100 and likely $300 has had huge gains in the past and AAPL clearly meets that criteria. More importantly though what is the PE, growth rate, and market cap? Two of the previous three items suggests that AAPL has plenty of growth ahead. The third questions that permise. The Financial Accounting Standards Board (FASB) is looking into a possible reimplementation of the mark to market rules that just about destroyed the financial system in 2008. How is it possible that they would even reconsider this concept? Didn't the recent flash crash further remind us that markets can be very irrational short term? Markets can and will become disconnected from the financial benefits of the instruments they track. In some instances they can be an indicator of future cash flows of the fixed income instruments they track, but do we really want to use a system proven to be wildly inaccurate just because the other main option gives management leeway to manipulate data. 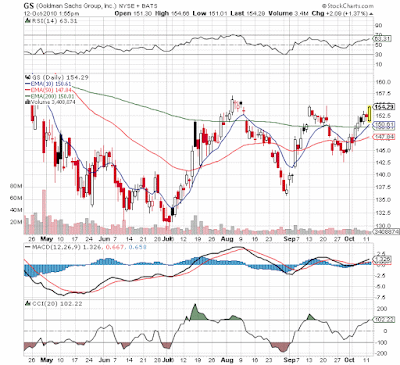 Very interesting to see the stock of Goldman Sachs (GS) appear headed to a triple top breakout when just about every analyst has downgraded its earnings potential due to reduced trading profits and market activity. Not to mention that the stock is ramping prior to earnings just a week away on the 19th. 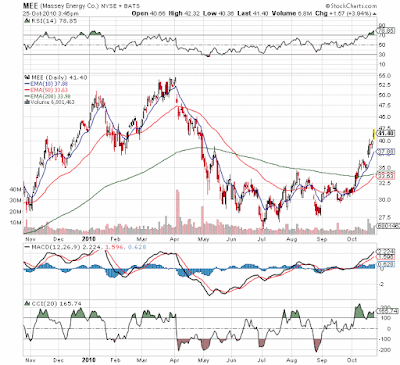 Also, note the higher lows in the chart pattern suggesting further strength in the stock. The lower moving averages are about to cross the 200ema which is another very bullish sign. 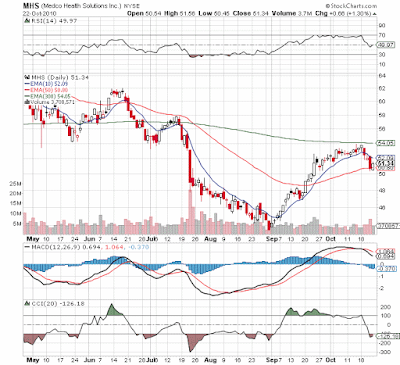 Though my portfolios have no position in GS, the stock is a leading indication of financials and the market in general. Right now the stock says the market is headed higher. 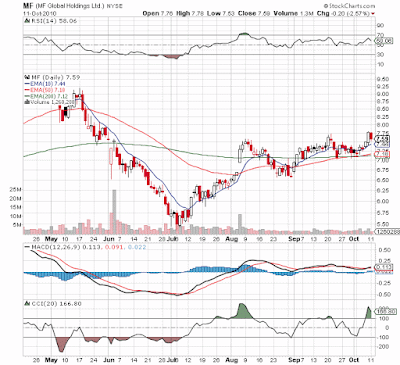 Our favorites in this general area remain MF Global (MF) and International Assets (IAAC) both of which have been breaking out lately as well. At least that's the goal that new CEO John Corzine has outlined for MF Global (MF). What exactly that entails it's probably much harder to grasp and understand. MF clearly wants to move into investment banking and money management sectors left dismantled by the financial regulations and credit crisis. It's also areas that Corzine and his new COO likely understand following their careers at Goldman Sachs (GS). Whether they can be successful pushing MF into these competitive areas seems up in the air.